Alamos Gold Inc.’s mining operations in Mexico, and exploration activities in Turkey, generate huge volumes of data that need to be transferred to the company’s headquarters in Toronto. 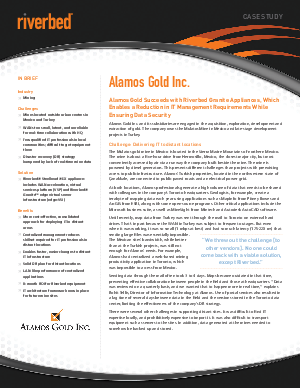 Alamos was able to avoid the costs of deploying actual servers at each mine site by implementing the Riverbed Granite solution – a Steelhead EX appliance with WAN acceleration, the Virtual Services Platform, and Granite edge virtual server infrastructure. With Steelhead CX appliances and Granite appliances in its data center in Toronto and Steelhead EX appliances in Mexico and Turkey, Alamos Gold found an effective, consolidated approach for deploying IT in distant locations.